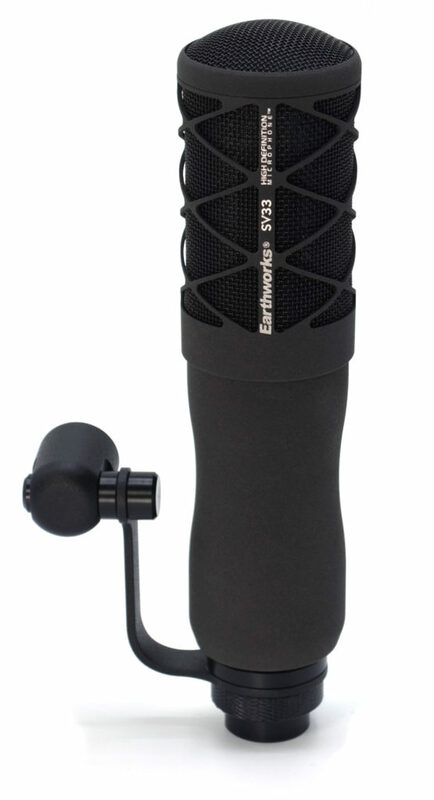 Earthworks is launching its flagship studio vocal microphone, the SV33, at the AES Convention in New York. The SV33 front address cardioid condenser microphone offers incredibly high resolution performance, providing staggering realism and purity of sound for male and female vocals. Featuring hand-tuned circuitry paired with a 14mm capsule, the SV33 delivers superior audio performance with the warmth of a large diaphragm capsule coupled with the stunning detail that Earthworks is known for. Incorporating Earthworks’ patented polar technology, the SV33 delivers a near-perfect cardioid polar pattern that is consistent up to 80 degrees off-axis. This revolutionary performance allows the singer to move freely in front of the microphone without sacrificing timbre or level. This microphone also has very low handling noise and a built in windscreen to prevent plosives. The SV33 excels at rejecting unwanted sounds at the rear of the microphone, while any sounds that do come in off-axis sound incredibly natural and uncolored. The SV33 boasts a frequency response of 30Hz to 33kHz ±2dB at 5 inches with self-noise of 15dBA, yielding a 79dB S/N ratio. Its maximum acoustic input level is 145dB SPL. Every SV33 is individually handmade in the company’s New Hampshire, USA headquarters and is housed in an elegant aluminum body with Nextel® Dark Black plating for low reflectivity and durability. The SV33 comes with a flexible mounting bracket for attaching the microphone to booms or stands. Each microphone comes in a custom designed carrying case to protect the SV33. The SV33 Studio Vocal Microphone will be available in December 2017 with a U.S. street price of $2,399.00. Visit Earthworks at AES Booth # 416 to be among the first to hear the new SV33 live.